Swimming is like writing: most people have been doing it in some capacity since they were children, so they assume they know everything there is to it. Not so. Both take a lot of practice. With both, you tend to be surprised that you've been doing something wrong your entire life. My brother and I took swim lessons from the time we were very young. We pretty much lived at the pool--indoor and out, winter and summer--with our house just blocks away from an athletic club. All the workers knew us by name. Then, when we were a little older, we took private lessons and even diving lessons (I never did really nail the back flip). Over the summer of 4th grade I joined a team: I entered every event listed and came away with blue ribbons most of the time. As I got older, swimming became something I only really did when I was injured from running, which meant I started to look at it as punishment. Where running and biking were adventures, swimming was always just a workout. When I moved to Colorado, I became more serious about triathlons. Which meant I had to really consider how much I knew about my stroke. I started improving pretty quickly, mostly because my husband swam in college and often gave me things to think about, and occasionally wrote my workouts. But it wasn't until I joined a Masters team that things started clicking. I took a private lesson and felt like I was in grade school all over again. I watched video of my position in the water, and a few times we even put mirrors at the bottom of the pool to see the full stroke. 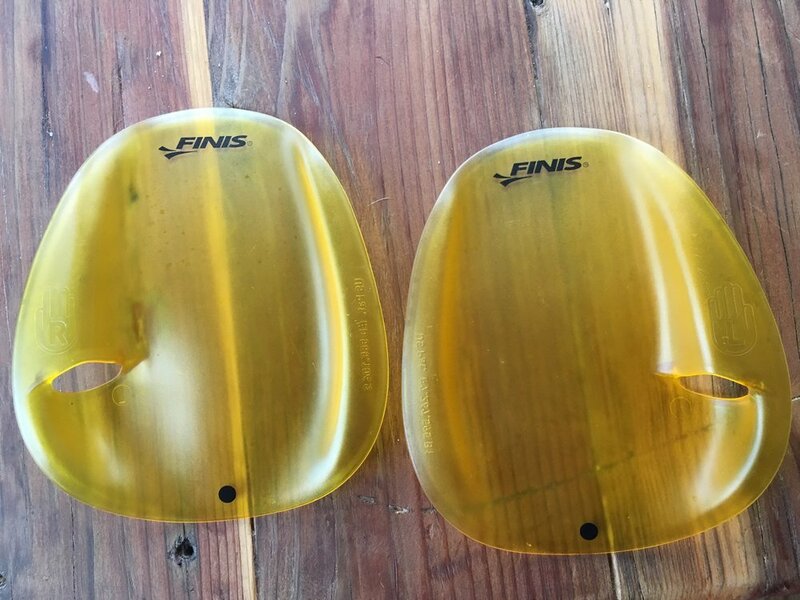 The other game-changer was investing in FINIS Agility Paddles. I found out that my literal weakness was not following through with my stroke. In a lot of ways, I was going through the motions but not really putting my muscles to the test. With my stroke, it's as though I've been riding in the small chainring for years, and just discovered the power of the bigger ring. Today we did a lot of pulling: the FINIS paddles are so nice because they're just slightly larger than your hand but they force so much more work to happen. Swimming is finally (almost) as fun as biking and running.